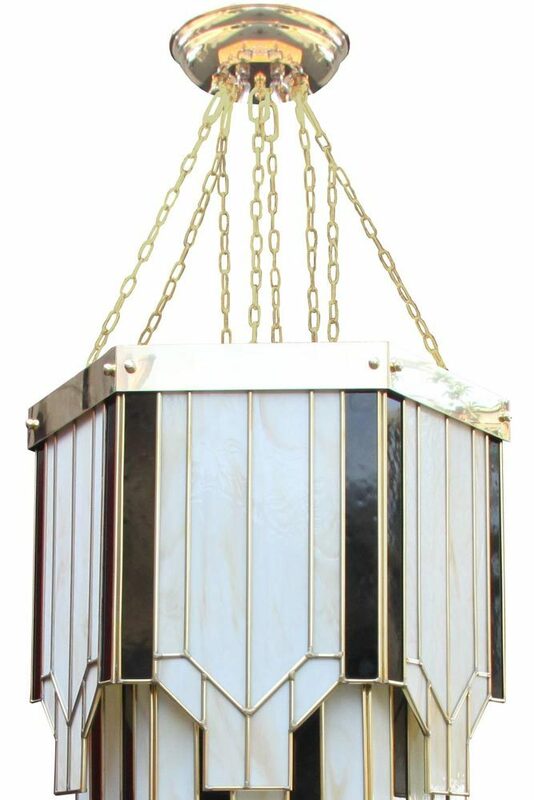 This large hexagonal Art Deco 8 light tiered chandelier is handmade in Britain and boasts classic black and white glass in gold finish frame. Featuring a circular ceiling cup and multi chain suspension, with hexagonal gold metalwork frame and three sumptuous tiers of art glass that taper towards the base. Layers of the finest quality veined creamy white and iridescent black art glass are soldered together to form each panel, with the creamy base colours used in the centre and black around the edges. Each panel finished in a peak and overlays the panel below. This chandelier is typical of original Art Deco designs and reproduces designs that would have been available in Madison Avenue for the select few. The use of geometric shapes within shapes, zig-zag patterns and stepped features are all associated with Art Deco. That, combined with bold black and white colour schemes are quintessentially Deco. This New York chandelier contains all of the attributes required to create a faithful reproduction of an original Art Deco ceiling light. If you are a fan of the Art Deco style and fascinated by geometrical aesthetics, bright metal finishes and refined lines, then this chandelier is for you. This is the best example of this design to be found anywhere and the quality, attention to detail and craftsmanship are of the highest standards possible. Pieces like this are stylish and don’t become available very often. This is a wonderful addition to any interior, which instantly elevates it to a higher level. 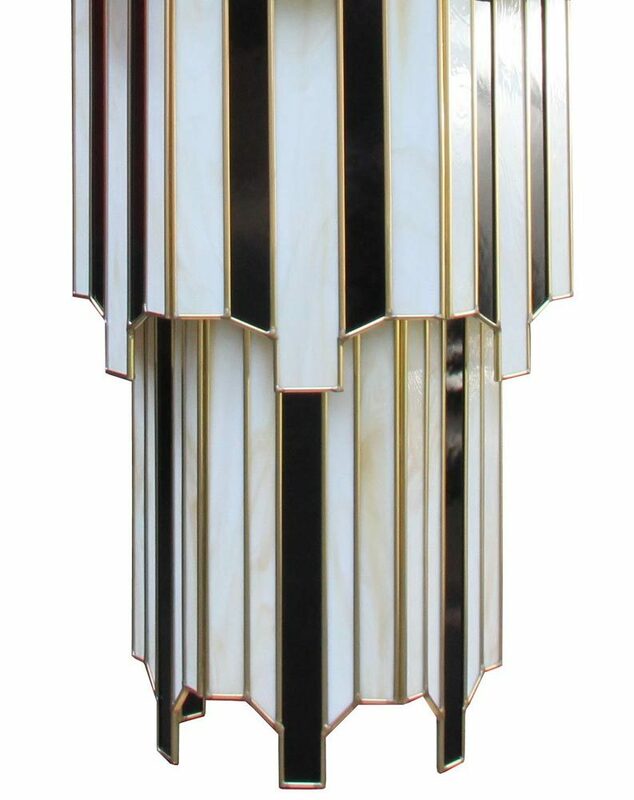 This stunning light was originally designed and commissioned for a well-known London department store and can now be offered as shown or as a bespoke package. Every detail can be adjusted to suit your requirements. Different coloured glass is available and metal finishes can be altered to suit. If you would like to enquire about any options, please follow this link to the contact us form or call a member of our team on 0151 650 2138. Suitable for a variety of uses including department stores, hotels, large hallways in period properties, stylish loft apartments, barn conversions, double height spaces or any large room with sufficient ceiling height. Please note that this is a hand-crafted product, manufactured in Britain to order and will take approximately four-weeks to complete. The body of this chandelier is 120cm high and is supplied with 50cm of additional suspension. Please ensure that you have the necessary height prior to ordering.